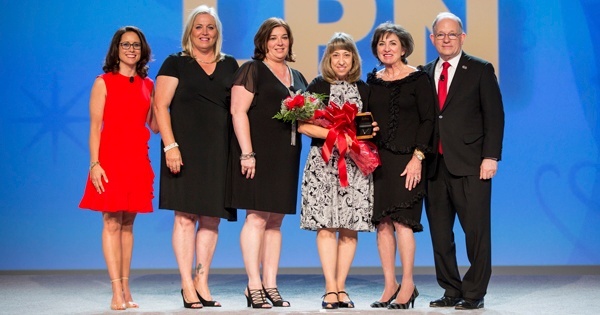 Pictured during BAYADA's annual Awards Weekend in Philadelphia, PA are (from l to r) National Hero Committee Chair Jackie Kirchhoff; Director of the Rock Hill South Carolina BAYADA office Amy Ramey; Client Services Manager Jenni Cairns; LPN Hero of the Year Cathy Medeiros; BAYADA Director Ann Baiada and BAYADA President and Founder Mark Baiada. Catherine Medeiros, LPN, was recognized as the national Licensed Practical Nurse (LPN) Hero of the Year by BAYADA Home Health Care, a leading provider of in-home care. 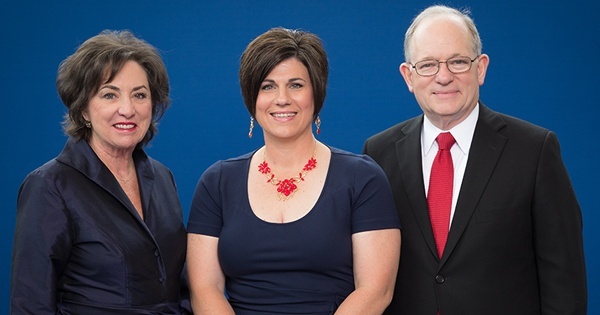 Chosen from among thousands of nominees, Medeiros accepted the prestigious award for exemplifying the highest standards of care before more than 2,300 employees at the company’s annual awards meeting held on June 3 in Philadelphia, PA. 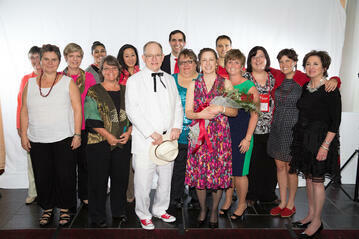 The award was presented by BAYADA President and Founder Mark Baiada. LPN Hero of the Year Tess Lambeth (center) is pictured with BAYADA Director Ann Baiada and BAYADA President and CEO Mark Baiada during the company's annual awards meeting held recently in Washington, D.C.
BAYADA Licensed Practical Nurse(LPN) Theresa “Tess” Lambeth was recognized as the national Licensed Practical Nurse (LPN) Hero of the Year by BAYADA Home Health Care, a leading provider of in-home care. 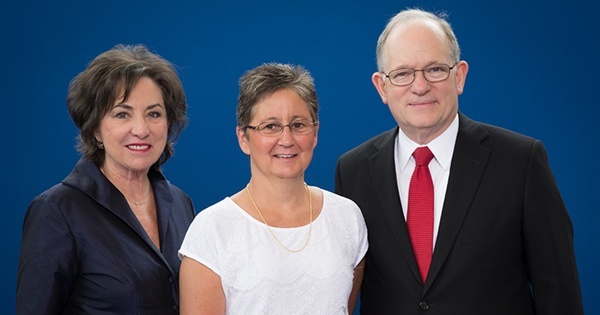 Chosen from among thousands of nominees, Lambeth received the prestigious award for exemplifying the highest standards of care before more than 2,300 employees at the company’s annual awards meeting in Washington, D.C.
National RN Hero of the Year Kelly Bivins (center) is pictured with BAYADA Director Ann Baiada and BAYADA President and CEO Mark Baiada during the company's annual Awards Meeting held recently in Washington, D.C. Registered Nurse (RN) Kelly Bivins was recognized as the national RN Hero of the Year by BAYADA Home Health Care, a leading provider of in-home care. Chosen from among thousands of nominees, Bivins, who works in the company's Shelby, NC office, received the prestigious award for exemplifying the highest standards of care before more than 2,300 employees at the company’s annual awards meeting in Washington, D.C. on April 30. On May 30, more than 2,3000 employees gathered at the company’s annual awards meeting in Philadelphia where four health care professionals were recognized as BAYADA’s National Heroes of the Year for consistently demonstrating our core values of compassion, excellence, and reliability. BAYADA Home Health Care named Cynthia Lane, an occupational therapist from its west Tucson office, as National Hero of the Quarter. The quarterly award is presented to employees on national and local levels who demonstrate BAYADA’s core values—compassion, excellence, and reliability—through extraordinary deeds in their work. Lane’s compassion is shown by the special place in her heart that she holds those who are most affected by traumatic events or unplanned illnesses. She knew how much one client, who lost the ends of her fingers due to illness, dreamed of doing her own hair. Lane went out of her way to find the right hair dryer, and helped her patient do her hair and apply her own makeup. “This was a special case where Cyndi showed how much she cared,” said Lisa Olson, BAYADA clinical manager. Registered nurse (RN) Sherri Lorette was recently chosen from more than 19,000 home health care professionals as the BAYADA Home Health Care RN Hero of the Year. 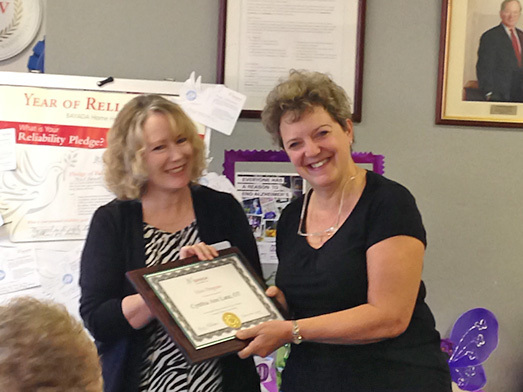 Lorette, who works with the BAYADA Hospice specialty practice in Norwich, received this prestigious honor for exemplifying the highest standards of care and demonstrating the company’s core values of compassion, excellence, and reliability. BAYADA President and Founder Mark Baiada presented Lorette with the Hero award during the company’s annual awards ceremony on May 17 in Charlotte, NC. During National Physical Therapy Month, BAYADA Home Health Care is celebrating BAYADA Physical Therapist (PT) John Robinson, an in-home rehabilitation specialist whose expertise and compassion were recognized with the company’s 2012 National PT Hero of the Year Award. 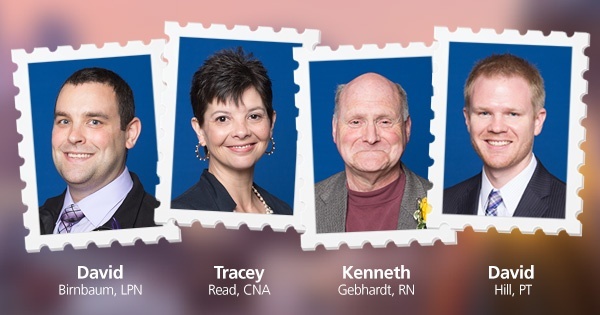 A registered nurse (RN), licensed practical nurse (LPN), physical therapist (PT), and home health aide (HHA) were named national Hero of the Year for their respective practices by BAYADA Home Health Care, a leading provider of home health care and hospice services to people of all ages. Each hero has a unique story about how their care made a significant difference in the lives of an individual or family faced with illness or disability. Family members of the heroes watched as each care professional received individual recognition before more than 1,600 employees at an awards ceremony, hosted in Washington, DC on Saturday, June 2.